I was just ♥LOVE♥ yesterday! It was just PERFECT! Haha.Oh. Not really. I was having a test - SE test at Sultan Ismail Mosque (Ainun told me it was Sultan Iskandar Mosque! Haha!). The test was began at 9.20a.m. Malas mahu cerita panjang. The test was totally a dull. A big one. A shame one. So, some of us decided to go and have some fun after the test. First, Ainun planned to watch for a movie at City Square. However, after thinking about it over and over again, we decide to just go to Jaya Jusco Taman Universiti. So, it means that we are not going for any movie. It's just okay with both of us. So, Ainun, Fadh, Ejat, Nik and me walked along the way from the mosque to the bus stop and wait for the bus to come. That was it. We didn't wait long for the bus to come. Just after we reached the bus stop, the bus came from nowhere and fetched us up. Unfortunately, the bus were full. So, we have to stand at the very front of the bus. Standing, okay? Nik didn't took the first bus. She waited for her boy friend. Hehe. Bahasa baik tau Nik. Aha. 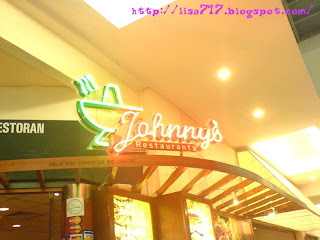 Dipendekkan cerita, we reached there and first had our lunch at Johnny's Restaurant inside the JJ. It was my first time eating there. I ate Nasi Ayam BBQ. But I couldn't finished it all. I gave it to Pa'e who came after a time together with Fara and Sue. Ah. The waitress were just too kind and friendly. Love them! And, Ejat ate a lot. She helped me out finishing my sweet chocolate ice cream that came along with the Nasi Ayam BBQ and tom yam soup and Thai tea. I didn't drink the Thai tea. But I ate the tom yam soup happily. Hehe. The taste was good. Really good. After that, we started our shopping. Honestly, it was my SHOPPING DAY ever! I never had my shopping like I did yesterday. I bought things that I kinda like most. And I made a new JCard of my own! It cost me at RM12 for the card. Ainun and Fara did it too. I love the fitting room at the men's side. Ejat, Fadh and me enjoy fitting the room ourselves. Haha. At last, we did bought things that we tried up before at the fitting room; except for Ejat. She refused to buy things except for those comics and novel. Haha. Ejat.. Ejat.. Eh, Ejat! Don't forget to lend me the novel, alright? Ainun, Fara, Sue and Pa'e continue shopping at Giant not far away from JJ. I went back to KP with Fadh and Ejat by bus. We were so grateful to get a PERDANA bus. Hehe. It was so tired but fun though. And that was the compliment of my yesterday's perfectness. And I love it. I felt alive. I hope I could live in it FOREVER. Alhamdulillah. Thank you, Allah.